You begin the game with just a 3x variable jump and lots of midair direction control, and running lets you build up momentum to reach a high rate of speed. There are a few areas where pink paint is stuck to various surfaces. 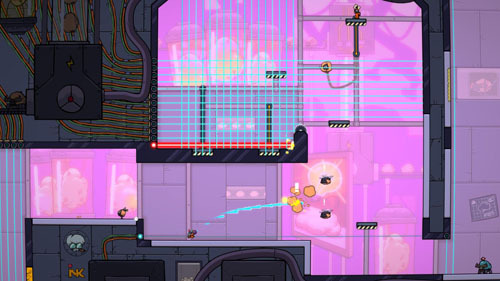 Running through pink paint on the floor slows you down, whereas you can run at full speed along pink-coated walls and ceilings. You encounter yellow paint in the opening area as well, which causes you to bounce high into the air, or ping-pong back and forth through narrow passages. Several areas also feature water sprayers which wash away the paint. The first fluid you acquire is water, which lets you clear away paint on command to eliminate obstacles – although thick paint cannot be erased – and you have to rely on previously-placed paint or paint emitters to use your bouncing or sticking abilities. 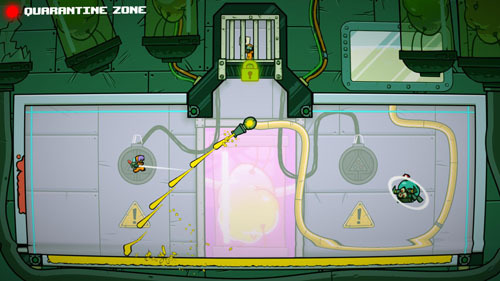 A significant portion of the game is played with just the water sprayer before giving the player the ability to spray pink paint, and later spray yellow paint. Occasionally, you encounter a fellow factory worker stuck in the paint, which may be sprayed away to free him, and some factory workers are placed in hard-to reach areas. Each of these orange jumpsuit-wearing fellows carries a letter, which eventually lets you spell out the word “splash” if you rescue all of them. These letters appear in order so you can determine if you’ve missed any. Later levels place these workers over dangerous obstacles such as sawblades or pits of slime, so you not only have to free them, but sometimes grab them out of the air while they’re falling. 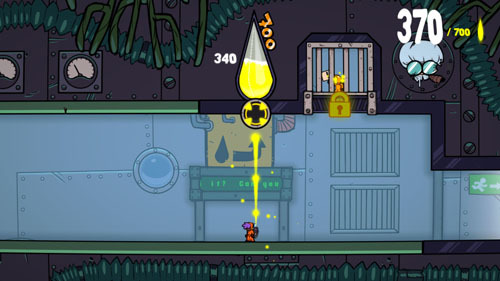 Each level features a secondary score-based objective that sees you collecting golden goo. You get this goo by cleaning off the walls, finding golden pinwheels that dispense goo in large quantities, and by killing enemies. If you manage to collect 700 units of golden goo, you can rescue the final factory worker imprisoned at the end of the level, which gives you an exclamation point to add to the end of the word “splash” and also unlocks a time attack version of the level. Levels contain almost exactly 700 units of goo, so you pretty much have to kill every enemy and explore every corner to collect it all, and missing even a little might mean you will reach the end of the level with only 690 units… and even when you have extra, it’s usually only 5 or 10 units. Since you don’t have a traditional weapon, you have to use your sprayer in creative ways in order to deal with enemies. Sometimes you can just use the force of the spray to push them back off a ledge or into a sawblade, but you can also use your pink paint to stick them in place, or use yellow paint to send them bouncing into danger. 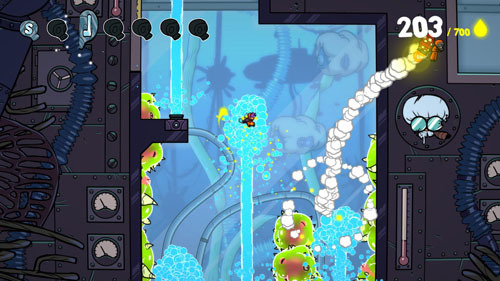 Many enemies can be avoided altogether, but you’re encouraged to face them in order to collect that precious golden goo, and the game offers many creative puzzle elements to let you take out enemies in unique ways by using the environment to your advantage, such as triggering moving platforms to send enemies into sawblades, exposing them to lasers, or knocking them into hazards. Rescuing factory workers is key to opening new areas on the hub, which gate your progress into later levels (levels are unlocked sequentially). In a nice touch, the hub is divided into areas that are representative of the mechanics employed in each of them. Skilled players should have no difficulty opening these paths, as factory workers are easy to spot, and it’s usually easy to tell what you need to do to reach them. If you accidentally lose one, you can kill yourself to respawn nearby and try again. Levels also feature standalone challenge areas that are accessed by entering small black hole-like portals, which teleport the player into a single screen environment. 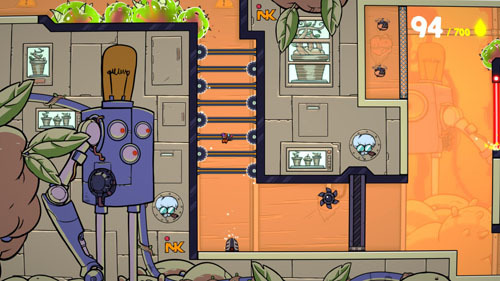 These areas are more puzzle-centric than the rest of the game, and the player must defeat enemies, clear obstacles, navigate tight quarters, and occasionally figure out how to set off chain reactions to free the factory worker and rescue him. 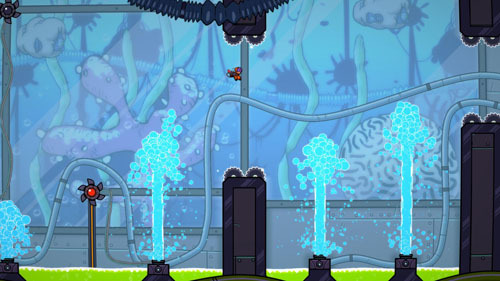 Failing the challenge sends the player back into the regular level, but he is free to re-enter the portal to try again. Checkpoints appear fairly frequently, and the pace of the game is generally quite fast, so there is little time spent between checkpoints. Outside of the challenge rooms, most decisions can be made on the fly, allowing you to deal with enemies and obstacles as you encounter them without having to think too much about what actions are required. 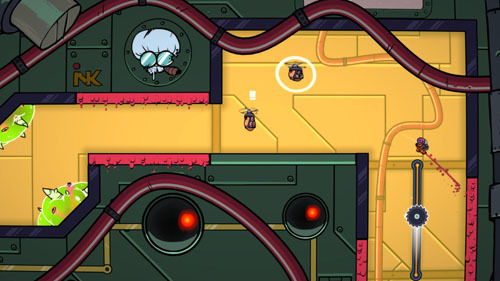 In a few instances, levels feature rising slime and auto-scrolling to force you to stay on the move, but this is generally how the game is played even without the added danger. The simple visuals and easy-to-read paint colors effectively relay the actions required to make it through the area and guide players in the right direction, and skilled players can also take on the game’s dedicated time trial and speedrun offerings. The game slowly escalates the use of your abilities to place you in increasingly complex and dangerous situations before unleashing hell in the final brutal gauntlet. 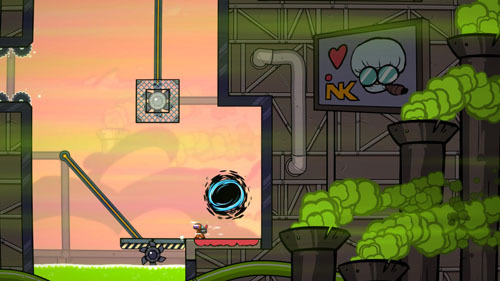 In later areas, you’ll need to use water to spin devices that move platforms or open doors, as well as blast baddies to trigger platforms that rise up out the slime, use pink paint to run up walls while fighting enemies and dodging slime projectiles, and quickly switch over to yellow paint to bounce off the walls, fly over hazards, and make perfectly-timed landings on the far side. Many later areas require advanced techniques, such as jumping up and around to the far side of a column, spurting tiny sprays of paint immediately after touching down, or flinging yourself against a distant wall and dropping pink paint to stick to it… only to run up the wall and spray yellow paint to get around a spinning saw blade. Here again, levels are designed to clearly communicate what actions are required on your part, so it’s generally clear what you need to do to successfully execute a series of maneuvers; it’s up to you to employ your skillset and actually pull it off. There are a couple of boss-esque areas that require you to complete a series of challenges without the luxury of frequent checkpoints. 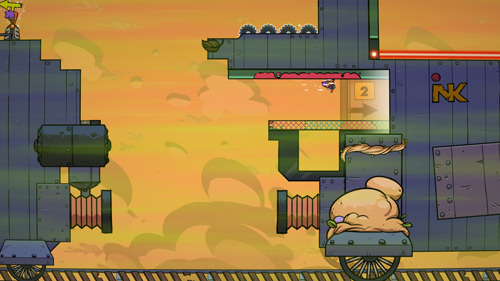 This includes a level where you run across the top of a train before diving inside, taking out multiple enemies, and disconnecting train cars before reaching the game’s antagonist… who is fond of flipping you the bird before he runs away. This is essentially a pure gameplay experience, with new elements added for no other reason than to alter the ways in which the player interacts with the environment. 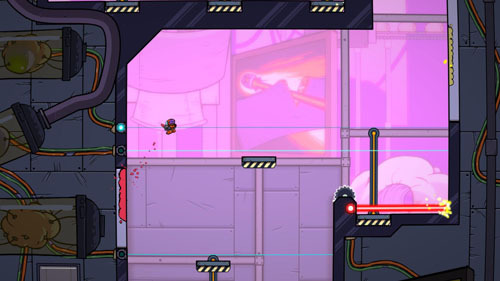 Metal grates let the player stick paint to the side but also spray through them to hit enemies or triggers on the far side. 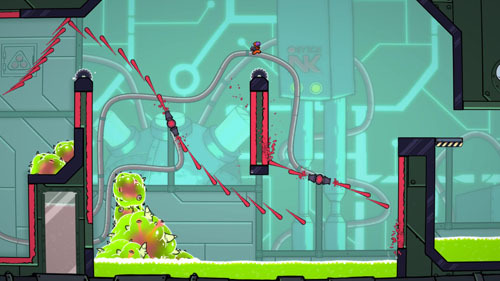 Wind pushes the player and enemies along in one direction, allowing the player to use pink paint to stick himself in place or to unstick enemies to send them to their doom. 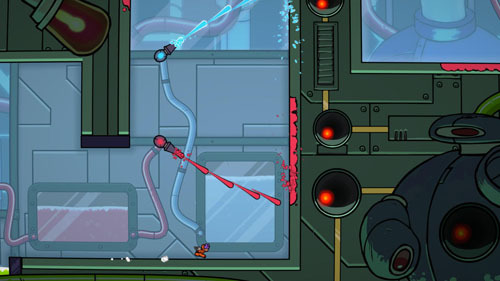 Lasers activate when you pass in front of them, but they take a couple of seconds to activate, allowing you to dash through a bunch of them without getting killed, or force an enemy into their path to blast them into oblivion. 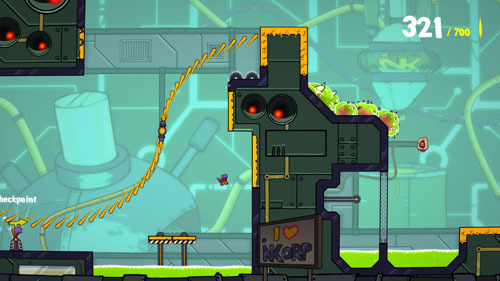 Players can also take on a couple of speedrun modes, including one that eliminates the need to rescue any factory workers – and also eliminates checkpoints – and instead sees you blasting through to the end as quickly as possible with online leaderboards to measure your success. There’s also a standard time attack mode that has you playing the levels and rescuing factory workers. 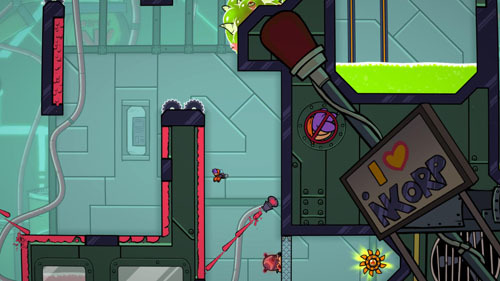 Aesthetically, the game offers very simple visuals that are designed to highlight what is required of the player mechanically in order to traverse the level. Color choices make it very clear which objects may be interacted with, where the player needs to go, and what will kill him. Even the obnoxious paint colors are designed for easily parsing the environment for quick traversal. Character animations – particularly for the protagonist – are lively and exuberant and emphasize the game’s fast pace, which is further enhanced by an upbeat soundtrack. 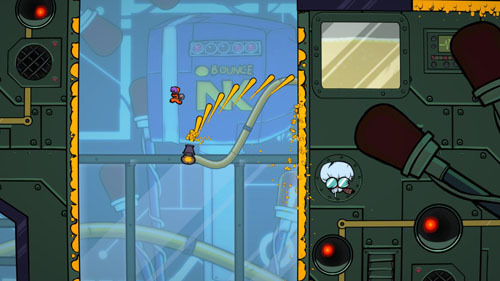 Splasher was developed by Splashteam, a France-based studio headed by Romain Claude, former designer at Ubisoft whose previous works include AAA platformers Rayman Legends and Rayman Origins, and he also worked on Seasons After Fall. Artwork was provided by Richard Vatinel, music by David Boitier, and music and sound design by Aymeric Schwartz, who previously worked on Absolver, Rayman Origins, and Valiant Hearts. The game was published by Plug In Digital, which also published Pankapu, Aurion: Legacy of the Kori-Odan, and Finding Teddy 2.